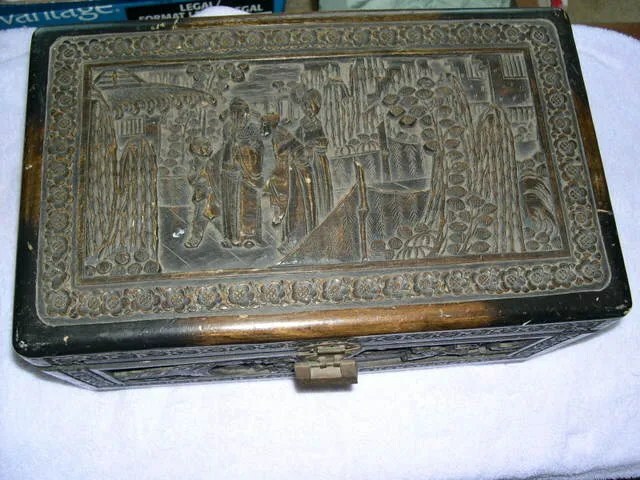 In her closet, foa alla years dat I can remembah, my mom kept one old, old, hand-carved Chinese chest. Inside it she kept all her treasures, like letters from my papa-san, old photos, stuffs lidat. Small kid time, I used to love dat chest. It whispered to me of secrets and love, of mystery, of things I longed to know. 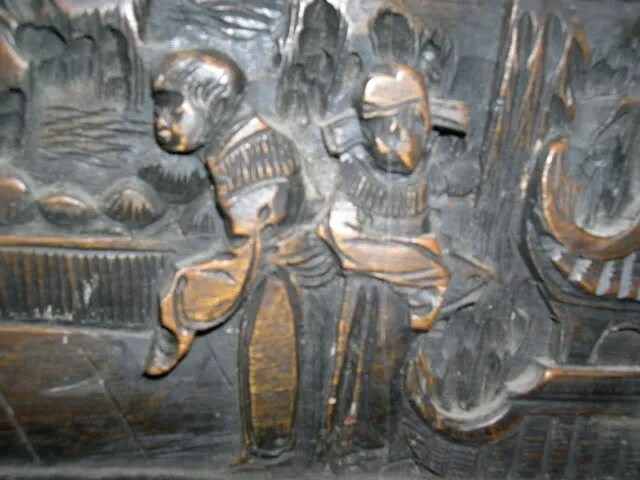 I used to run my fingahs ova alla carvings, wondering who wen doyem, and when. I wen grow up, but da longing to see wat was insai never wen leave me. I would beg my mom, “Eh, now can we look at da stuffs insai?” Cuz she alla time telling me, “Someday we stay going.” But dat time nevah wen come. She oni wen tell me one day would be mines. But den one friend of hers wen come by. Anden anodda one. And wasn’t till latah dat I wen find out from my maddah dat she had arranged foa alla dems to come by. I guess was moa easy foa do dat den open up da Chinese chest and let all her feelings come out. We nevah wen open da chest, nevah even wen get it outa da closet. Moa years wen go by. 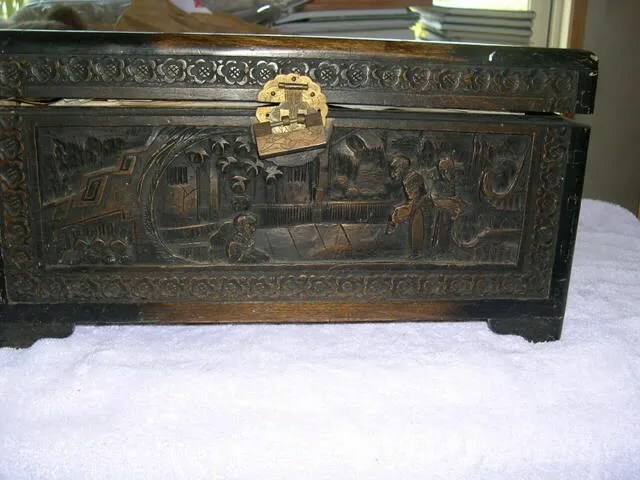 And still da chest stayed closed, holding alla mystery, alla love letters, and da photos. Two months ago, my maddah wen mahke. Unexpectedly. And us siblings were left to sort chru alla stuffs. 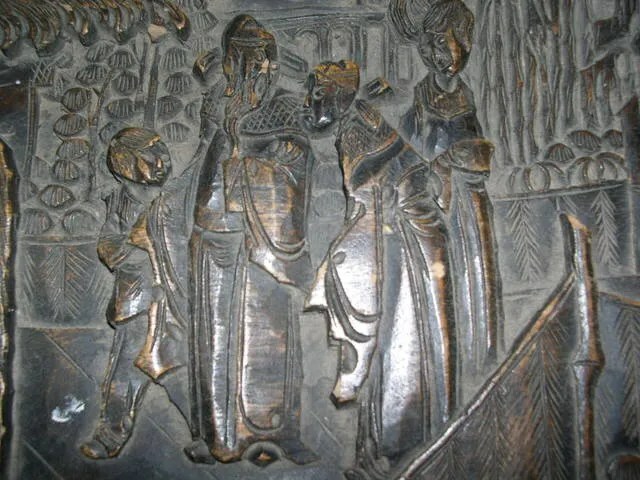 My maddah wen designate certain tings to certain keiki and mo‘opuna [grandkids], but she nevah wen mention da Chinese Chest. My heart wen start racing. Hakum she nevah wen say dat she was going leave me dat old chest? I wen tell my sibs wit trembling voice , “Eh, mom alla time wen tell me she was going leave um to me.” And mahalo to my sistah, she wen tell our braddah dat she wen remembah mom saying da same ting. Da chest stay mines. Mines to go through. But sadly, not with my maddah. Dat would have been da best way. Slowly I been going through all stuff in da small chest. Get one class photo of me in first grade, da barefoot keiki wit da curly hair. Get all kine wonderful stuffs, like da letters from my papa-san to her when he stay hana foa Kahului Railroad on Maui. I love dis chest. Was made in China, but adunno when. Nomo marks on um to say. 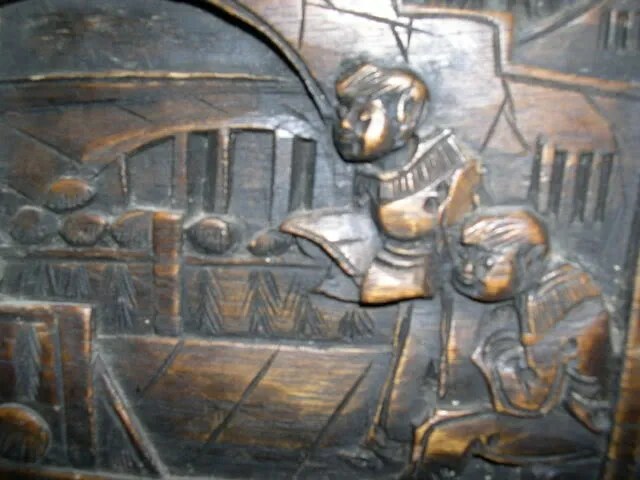 And even today, like small kid time, I run my fingahs ova alla carving, wondering about da long-dead woodcarver who wen put so much time and effort into making dis nani [beautiful] treasure that is finally mine to love, and to pass onto my own keikis when da time comes. But one ting foa shua. I not going wait till I mahke foa my girls to find out wat stay insai. 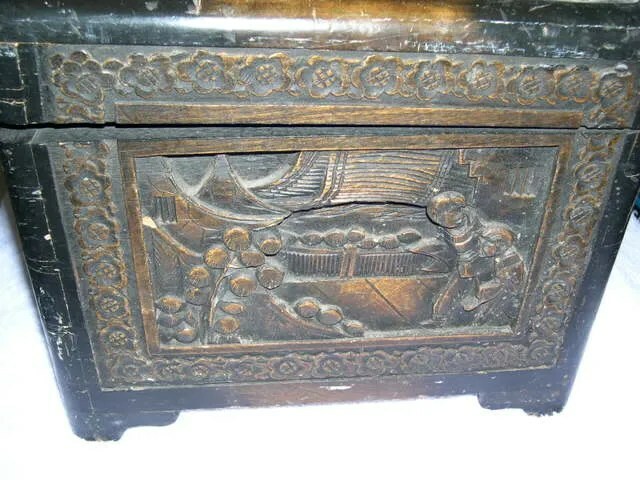 Foa my mom, Ua pa‘a kona pahu i ka laka ‘ia [her box was tightly locked]. Awww that is touching. TREASURE indeed. Makes me smile. And yes! No wait to share the contents with your keiki! They can build memories peeking in there when their mama stay. Good idea! How awesome. Nice memories too. My MIL has a ragged old suitcase under her bed. Ever since the kids were little they’ve wanted to look in that suitcase and their Grandma says no, you have to wait till I die. I think the kids have stopped asking. Mostly its old pictures in there. Old pictures she doesn’t want to explain to her Grandkids. LOL I think its “da baby daddy” – da Grandpa. 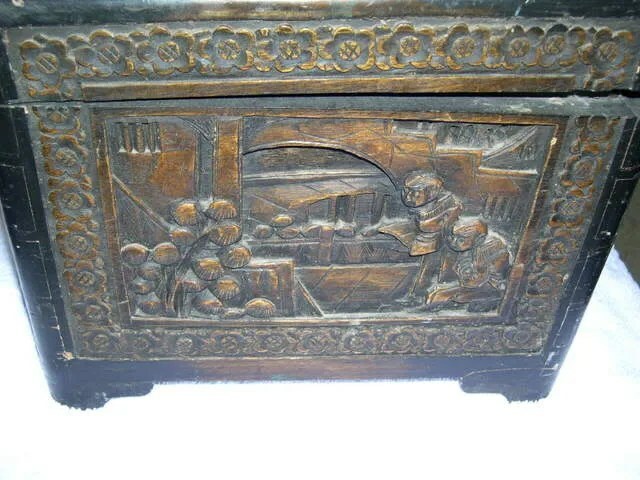 I remember those old carved chinese chests. They don’t make them anymore. What a great gift from your mom and a gift to your daughters as you pass it down. I say fill her up with fiber. With tears in my eyes, I am looking at the pictures of the chest. I wish she had gone through it with you. I’m glad you have it now. I am with you. What a nani chest. How wonderful to find that your mom kept all those treasures inside, even if she didn’t share with you while she was alive. “Kakaroach um”!! I’m giggling and smiling at the computer! Yer a NUT! I admit I was a little SCARED…at first…..but decided well, like I said…Yer a nut! PS Glad you liked my pictures! 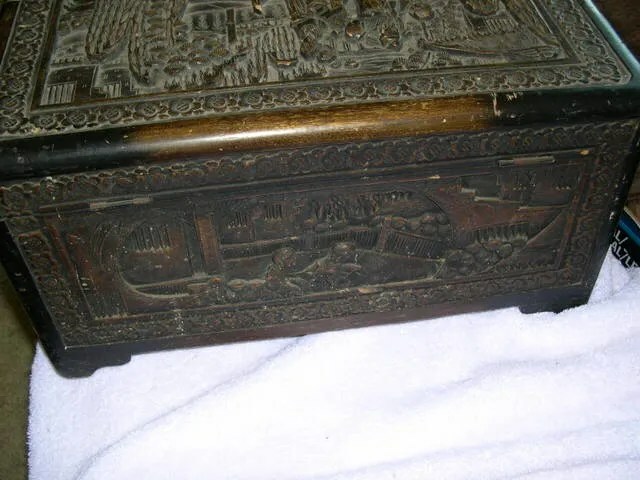 Aww, dass wun beautiful chest, an da memories held inside, and around it, precious. Secrets….. my mom had some. too. I always tought, and she always said, dat my dad was one cool and undemonstrative buggah. Nevvah give her notting fo birfdays, anniversaries, ladat. Den dey bot wen mahke, an I find, in one old bureau drawer, one bambucha stack of MUSHY, FRILLY , BOOTIFUL cards he wen give her, an she save! Ho, was shocking. So I guess da makule old buggah was a softie after all, jahs nevvah wen know how fo show em on da outsai. Oh my GOSH! 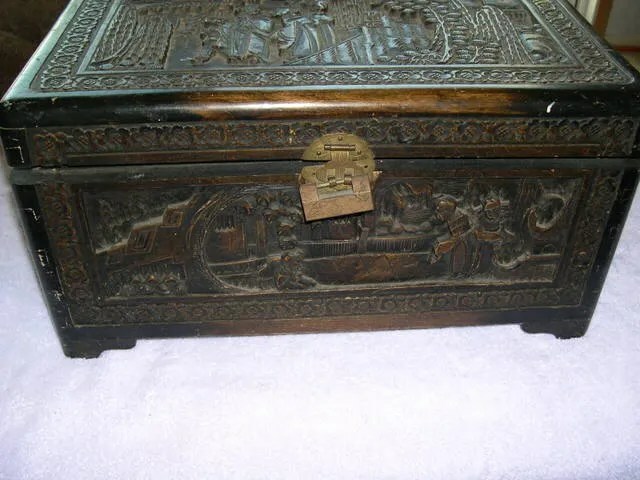 I have a chest just like that – my grandmother always said she would give it to me, and just before she was taken to a nursing home, she finally told me to take it to my house. It is amazing! 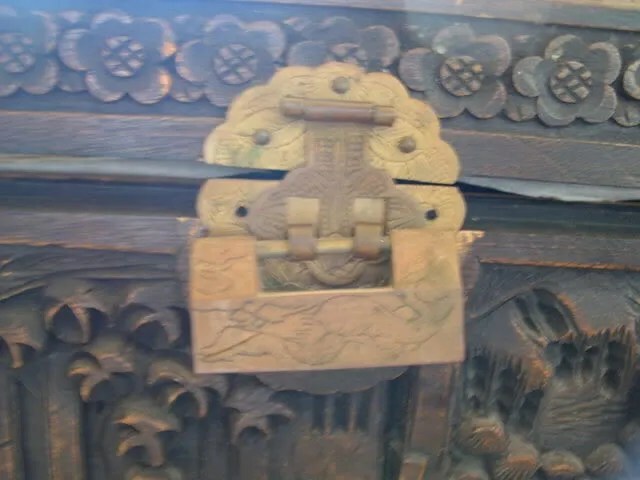 I was always fascinated by the “Secret lock” and the smell of the wood. I should make it a memory chest for MY children. *sigh* What a great day to read your blog. Pingback: Mokihana's Garden » Blog Archive » I Did It!